Sometimes I nail a recipe on the first try.. this time, not so much. I tested these vegan sausage biscuits no less than FIVE times to make sure they were perfect. And friends, they are delightful! 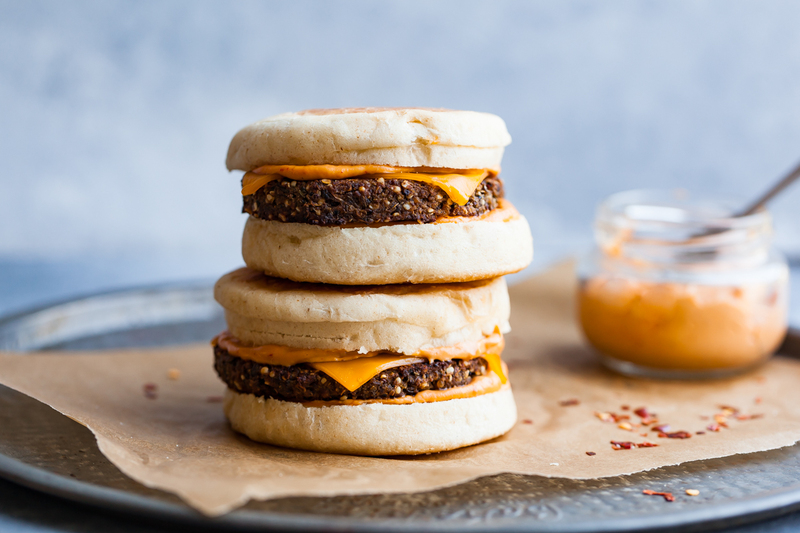 Made with wholesome ingredients like lentil, quinoa, and hemp seeds, these vegan breakfast sausage patties are to-die-for. They’re gluten-free, soy-free, and nut-free, perfectly spiced and finished with a touch of maple syrup. The vegan sausage patties are freezer-friendly and perfect for meal prep! I love making vegan sausage biscuits with plant-based cheddar and maple chipotle aioli (omg YUM it’s so good!) but the vegan sausage patties also taste amazing alongside fluffy pancakes or vegan waffles. Because I tested this recipe so many times, I basically got to eat vegan sausage biscuits every day for nearly two weeks! Mmmmm, those were very delicious weeks! I hope you love these vegan sausage biscuits as much as I do! To save this recipe for later, pin the photo below! If you try this recipe, be sure to rate it in the comments! While you’re at it, tag a photo of your tasty sandwich with #carrotsandflowers on Instagram so I can admire your creation! For more scrumptious vegan breakfast recipes, check out my Vegan Broccoli & Leek Frittata or my unbelievable Vegan Lox with Cashew Cream Cheese! AMAZING vegan sausage biscuits with maple chipotle aioli. Wholesome ingredients + BIG flavors make this an easy recipe the whole family will love! In a medium bowl, mix together the psyllium and water. Set aside to thicken. Add ½ cup quinoa, ½ cup lentils, hemp, oil, sage, dates, thyme, fennel, salt, syrup, and pepper flakes to a food processor. Process to a smooth paste, about 2 minutes. Stop to scrape down the sides. Add the mixture to the bowl, followed by the remaining 1 cup quinoa and 1 cup lentils. Mix well until thoroughly combined. If the mixture feels too sticky, add 1-2 tbsp of chickpea flour. If it's dry and crumbly, add 1 tbsp of coconut oil or maple syrup. Chill the mixture for 30 minutes. Preheat the oven to 400 F. Make the chipotle aioli. Add the cashews, chipotle, syrup, water, salt, and lemon juice to a high-speed blender. Blend on high until smooth and creamy, about 3 minutes. Line a baking sheet with parchment paper. Press ⅓ cup of the chilled lentil mixture to a large biscuit cutter the size of an english muffin. Bake the vegan sausage patties for 20 minutes, then flip and bake for an additional 15 minutes. Layer the vegan cheese over the patties for the last five minutes. Split and toast the english muffins. Spread 2 tbsp maple chipotle aioli on the inside of each muffin. Build the sandwiches with a crisp vegan sausage patty and enjoy! To save time, prep the vegan sausage mixture the night before. Chill overnight and bake in the morning. The patties can also be shaped, wrapped, and frozen until ready to use. Add 3-5 minutes to the cook time if baking from frozen. Could I use xanthum gum as a replacement for psyllium husk powder in the sausage recipe? Hey Chris! I’ve never worked with xanthum gum, aside from using it to stabilize vegan meringue. I’m not sure how it would be in this recipe. I love the psyllium husk for the the glutenous texture it provides. The only other way I tried the recipe was with flax, which did not turn out as well. If you decide to experiment, please let me know how it turns out! Of course! I’m sure they add a great sweetness. Also noticed the same with the flax meal. But regardless the recipe is fantastic. Honestly, you’re a magician. Thank you! oops! meant to reply below. Made these last night with my partner and they came out really good! We were pleasantly surprised. Saw that in your above photo you included dates in the recipe but they were not in the actual recipe toward the end! I’m wondering where you added the dates. OMG! Thank you for catching that! The dates go in to the processor in step two. I’ve been such a space cadet since working from home with a very busy toddler! I’ll be sure to proof my recipes more carefully in the future. I’m so glad you enjoyed the recipe though! Love the sauce! It can be used for so many other dishes. Thanks for sharing the recipe.